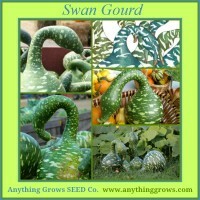 Whether True Gourds, Angled Gourds or Edible Gourds, all of these squashrelatives are from the Old World originally, and all need similar conditions: a long season of hot weather, and abundant moisture in a rich soil. May be direct-sown into warm soil, or started indoors a few weeks early. The fruits will be straighter and more symmetrical if the long vines are trained up a trellis, but all may be allowed to sprawl along the ground; some may run 20 feet! The perfect haven for your feathered friends. 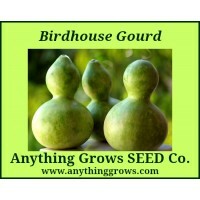 Birdhouse gourds are a long-handled ball-shaped courd. Use your personal touch to decorate. Can be painted or left natural. ..
Luffa (aka Loofah) is a very practical and useful gourd which can be used for bathing, filtering and cleaning. It is shaped like a cucumber but is larger, at 1-2 feet in length and 4-5" in diameter. As it ripens it develops a network of fibers that surround many flat, blackish seeds. Can be grown on a trellis or fence. 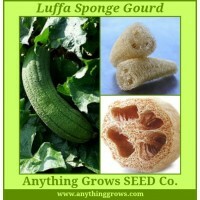 Luffa - 120 days - 1 to 2-foot long cylindrical fruit - fast growing. Also know as the vegetable sponge, the dishrag gourd, and Chinese okra. 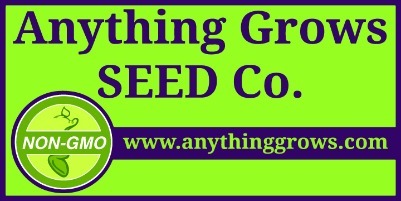 M..
Best results from directly sowing into a sunny, warm, well drained garden, June through July. Expect at least 95 days before harvestable fruit matures. For cleaner fruit, vines can be trained to grow on a trellis. Cut ripe fruit from the vine when firm and no longer yield to pressure. Be careful not to bruise--this encourages rot. Wash fruit and store in a warm, very well ventilated place to dry for at least 2-3 weeks (occasionally turn the fruit) – larger fruits take longer to dry. Should..